When people find out how much polish I have, one of the questions I usually get is "How do you keep track of it all?" I'd be lost without my beloved spreadsheet. Nail Board made me do it back when I first really started growing my stash. I'm so glad they did! I only had maybe 150 when I created the spreadsheet. Adding to it as my collection grew was much easier than starting later would have been. Keeping up with it has been work, especially if I do a BIG haul, but it's become vital to the way I use and store my polish. There's been a page with a link to mine and a template to make your own, but I've never given it the post it deserves. Time to fix that! 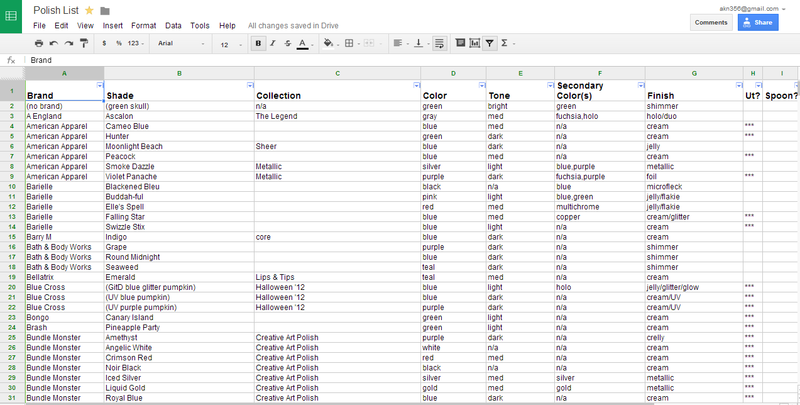 Here's an almost pointless screenshot of my spreadsheet as-is, just to get things rolling. I use Google Drive. It may be a little hard to see, but the top row is the key. The columns from left to right are Brand, Shade, Collection, Color, Tone, Secondary Color(s), Finish, UT?, and Spoon? The first three are self-explanatory and are really all you need if you just want to make sure you don't accidentally buy the same polish twice. I use it for that, but so much more too. "Color" here is the base color, "Tone" is the lightness or darkness of the base color, "Secondary Color(s)" is the color of anything that may be in that base, "Finish" is the type of polish, "Ut?" is short for "untried yes/no" ("***" for yes, blank for no), and "Spoon?" is whether or not I've done a swatch spoon of that polish. Filling out each cell for each polish creates a detailed, yet simple list of every polish in my collection. If I forget which shades I have from a specific collection? Filters! Standing in a store admiring a dark purple with gold shimmer, but wondering what it reminds me of? Filters! This is also how I decide on untrieds to use. Say I want to wear an untried China Glaze shade...I can see them all at once with a couple of clicks. I used to use the Drive app too, but the last update screwed something up and now my spreadsheet won't load in-app. Browser works fine. Portability isn't the only thing though. For whatever reason, Drive works slightly differently on mobile. Filtered rows keep their usual number in the screenshots above, which were taken on my computer. On mobile it just counts them instead. It also shows the count at the top of the page. When I say I have a certain number of something, this is how I know. Let's take blue for example. How many blues do I have? A lot. A damn lot. 280. How many of them are creams? An even hundred. Yep. How many are untried? Fourty? Oof. I need to work on that! Narrowing it down by tone makes it easier to pick one. Just 19 polishes in my ginormous stash are untried medium blue creams. This is why my untrieds don't intimidate me. Nineteen is a much easier number to handle than 757. I use this thing constantly; when shopping, organizing, picking a polish to wear, writing posts...all of the time! I've spent way more time using it than building and maintaining it and it's as important a part of my collection as the storage. Everyone who keeps a spreadsheet does it at least a little differently, but if you like my way you can use my template. 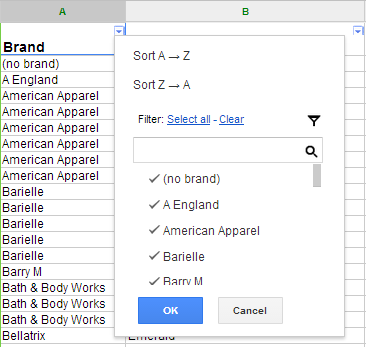 Drive works with your existing Google account, so all you need to do is click "File" and "Make a copy" to start filling it in with your collection. I think my brain would burst into flames if I tried to get this organized. I realllllly wish I could, I just don't have it in me. It seems like a great system tho, yay you !! Also - cream vs creme ?? Seems like people plant themselves in one spelling or the other, lolol. Nice post ! I REALLY like this. I have two spreadsheets currently. A private one with the date and where I bought certain polishes because nothing helps me slow down faster than proof that I've been to ULTA three times in the same week. The second one is a public one which I'm trying to make as organized as this, but I just haven't gotten around to it. I'm probably 400 polishes behind on it so I'm really hoping that I'll be able to start over and keep it organized. I really like this! I would add the column "dupes" So I can keep myself from accidentally buying any known dupes of polishes I already have!